This third and last book of the Egypt trilogy is on tour with RABT tours from now until Apr. 13. You can follow the tour and enter to win one of three copies of this compelling book. But that’s not all. In the Promised Land is now discounted from $3.99 to $1.99 for the duration of the tour. So, if you have been waiting for the price to come down so you can pick up your copy, here’s your chance. Based on a true event, In the Promised Land wraps up the lives of the characters in a neat and satisfying way, according to some readers. Like the rest of the series, the story is set in the beautiful twin – island nation of Trinidad and Tobago. The two main characters, Marva and June, have come out of an abusive childhood (Egypt) and are now adults. Marva is a nun at a home for delinquent girls. Marva is known for being strict and well disciplined, but when her adoptive father is killed in a Muslim coup, the family relies on her levelheaded calm to help them get through their crisis. But little do they know that Marva has a crisis of her own, one that her discipline and her faith seem inadequate to handle. 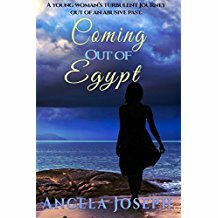 In time for Sexual Awareness month, Coming Out of Egypt, the first book in the series will be featured in a Book Cave promotion all month long, beginning tomorrow April 1. at the low price of .99c. You can follow the tour here. This is an affiliate link, meaning if you click on it, I will receive a commission. Thank you!